Last Chance Alert! Art Spots: PL!NK and Gato Closing This Month! If you haven’t yet visited PL!NK and Gato, two of the Crocker’s wonder-filled Art Spots for kids age 5 and under, this is your chance! These two Art Spots will close October 29th. PL!NK, an immersive and interactive kaleidoscopic installation, was created by UC Davis design professors Glenda Drew and Jiayi Young. Gato, a serene installation that allows children to step into the dreams of a giant toy cat, was created by Davis-area artists Michelle Lee and Darin Reyes. 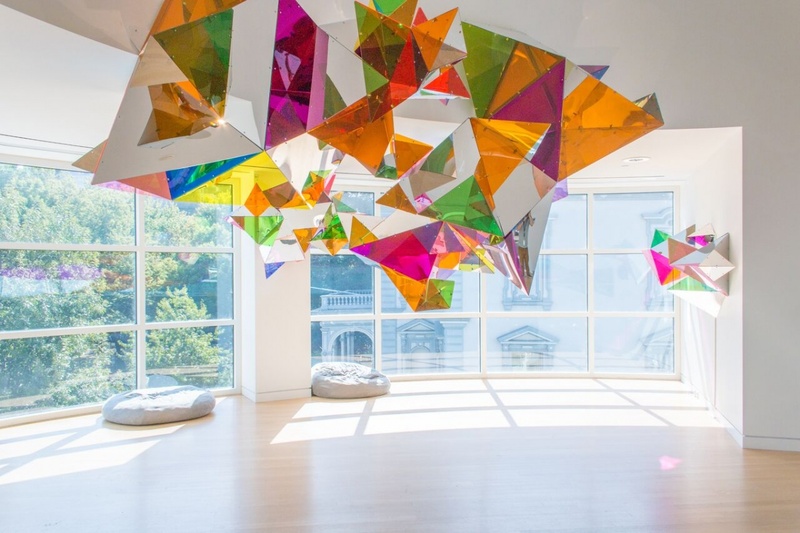 Before we say goodbye to these popular installations and prepare to install the next Art Spot, Wingding, we checked in with the Crocker’s Director of Education, Stacey Shelnut-Hendrick, to hear more about how Art Spots came to be at the Crocker Art Museum. We have now have seen three Crocker Art Spots, and they seem to be a hit. What was your vision behind Art Spots? For the last seven years, the Crocker has become known for its early childhood education programs. There’s Baby Loves Art for infants; Artful Tot for children ages 19-36 months; and Wee Wednesday, which is offered weekly for ages 3 to 5. We also have Tot Land and StoryTrail, but when these were created, I felt like something was missing. Then, one day, it hit me…we didn’t have art for early learners. Yes, we had art that they could certainly enjoy, but I wondered what artists would do if given art for children in this age group as a directive. There are wonderful examples of this concept, such as the New Children’s Museum in San Diego, but I wasn’t aware of any art museums that support artists in projects to create art for their littlest visitors. What did you think Art Spots would do for the Crocker? We wanted them to be enjoyed by all ages, but mainly little children. We created Art Spots to elevate and expand the quality of museum experiences for young children and attract diverse audiences to the Museum. I am interested in redefining what a museum is and can be. For me, Art Spots is one more way to achieve this. What is the process behind the development of each Art Spot? Some of the process was planned, but much of it was organic. We essentially began with an artist-in-residence model. But, we selected artists based on being really great people as well as being good artists. Art Spots has been an experiment for us, and in our first installations, we especially wanted artists who embraced this idea. We got a wonderful set of artists together to work on the first four Art Spots and two early childhood educators to advise them. We had them immerse themselves in our early childhood programming and other things happening in the region for infants and toddlers. We met with them individually and as a group and became a learning community. They supported and encouraged one another, and came up with four distinct artworks that have a lot of thinking behind them. Have Art Spots have been successful? Yes, and for different reasons than I originally envisioned. We are seeing a diverse group of audiences. Art Spots have increased the number of families that we are seeing at the Museum generally, but we are also seeing a lot of repeat visitation over short periods of time, which we didn’t really plan for. We are building a strong affinity toward the Crocker and hopefully museums in general. I always ask…Why can’t people visit museums as they do malls or grocery stores? Instead of once in a blue moon, museum visits can be part of what they commonly do. And, Art Spots are generating that type visitation. Art Spots have been so well received, don’t be surprised if you see more in the weeks and months to come! Each provides its own unique experience, so be sure you and your children check out PL!NK and Gato before October 29th, and look out for an immersive 3-D installation, Wingding, created by local artist Sonja White, coming soon. The Dreamboat in Tot Land will be sailing indefinitely, so be sure to visit this Art Spot as well! Remember, general admission to the museum is just $10 for nonmember adults and $8 for youth. Children 6 and younger are always free!